Item number 391/1 a from the MOA: University of British Columbia. Red and yellow jacket with striped sleeves. The jacket is made of shiny yellow damask woven with roundels and squares like stylized Chinese characters. The centre opening has front panels that overlap to the right when tied closed with two long red damask ties. The left panel and the centre back seam are edged with red piping. The lower point of the left panel has an appliqué motif in red approximately the shape of a heart. Red damask panels are inserted under each arm. The garment has a deep V neck outlined with an appliqué red damask facing. The left outer facing is rounded at the lower edge, while the right is straight and projects beyond the front edge. The neck is finished with a narrow facing or collar of white paper covered with sheer fabric. The long sleeves are deeply inset seams curving outward and a convex curve on the lower edge, narrowing to the wrist. They are made of brocade woven in six different coloured stripes parallel to the body of the garment and embellished with flower, bat and butterfly motifs and stylized characters woven in red. The ends of the sleeves are made of red damask with roundels enclosing a bat motif and stylized character. Thin white inner nylon ties are sewn to the inner right inner facing and the left underarm seam. The inner lining is yellow nylon mesh with white interfacing. 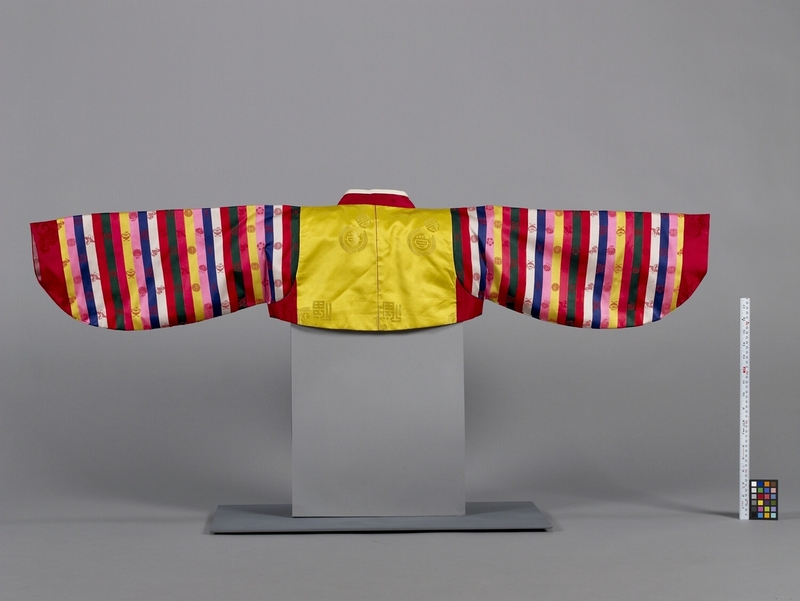 Such “Jo-go-ri”, made of synthetic fabrics and with very rounded rainbow “saek-dong” sleeves, were worn by girls and women on festivals and other special occasions in the late 1960s-70s, and were typical of that period. The red appliqué at the lower front corner was very popular then. The piping and underarm panels were also typical of the time. The V neck was not as deep as it had been earlier, and was more modest, allowing for more fabric below the closing. The front facing was straighter than it had been earlier. 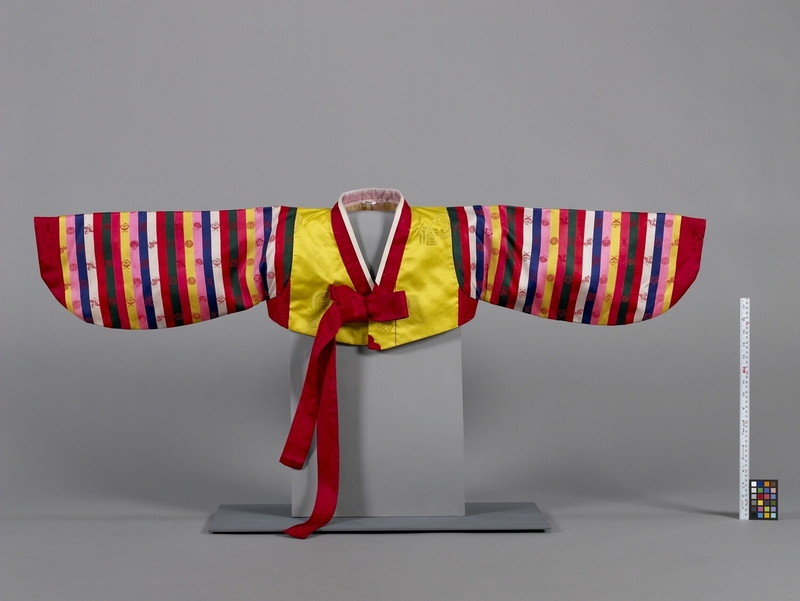 By this time the rainbow “saek-dong” sleeves were made of fabric woven in stripes, rather than being pieced as they had been previously. The Korean textile industry had developed to the point that it could produce such fabrics by this time. By the late 1960s-70s, Korean people generally wore simple clothing so that they could work more efficiently. During the 18 years that Park, Chong-hee was president, the transformation of South Korea from an agricultural country to an industrial one was accomplished, and people were urged to work hard. In compensation, people wore elaborate clothing on special occasions. 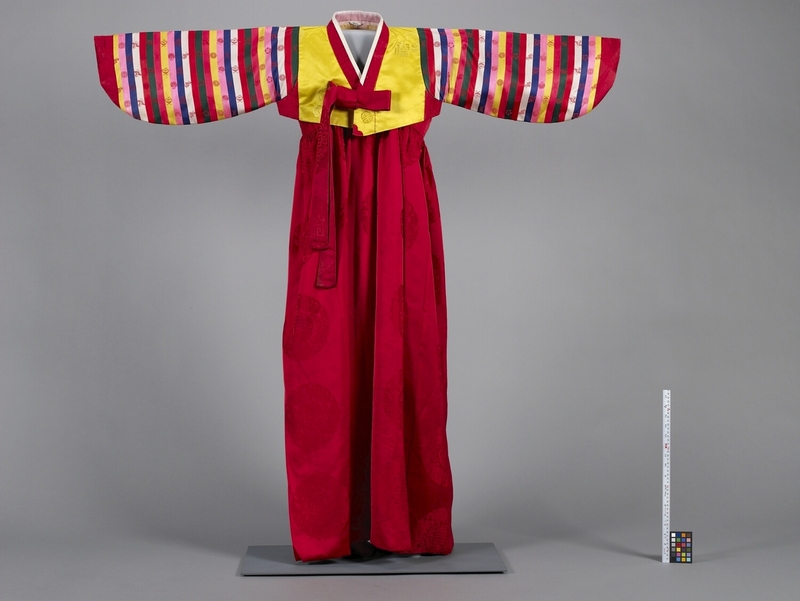 Graceful curves, like those at the lower edge of this garment, are important in Korean aesthetics and reflected in various forms, including architecture. Those sets with yellow “Jo-go-ri” and red skirts “Chi-ma” were worn by brides. Usually a bride spent one or two months after her marriage with her husband’s parents. Every day she was expected to bow to them while wearing her bridal clothing, which she also wore while working in their home. Guests came to see her dressed in her bridal clothes, as her mother-in-law showed her off to them Clothing of this kind was made in markets, and the relatively rough finishing, with the fabrics folded inside at the seams, is typical of that work. The garment is machine sewn except for the stitches attaching the white collar, which are done by hand. The inner facing and the edges of the garment are secured with blanket stitches. The outer facing and the red appliqué are secured with invisible stitches. The stylized square character means “good fortune” and is shaped like a shaman’s talisman.